When you say Switzerland, you may picture green pastures with cows. Or may be chocolate and cheese. Some may think of banks or watches. Switzerland is much more than that. This small country has fantastic nature, well preserved and looked after, different places of interest and is visited by tourists from all over the world yearly. I had the chance to see small part of it, although I have been there numerous times. Each time was memorable. Whether going hiking in the mountains, having boat trip on the lake, visiting old towns, the time was precious because it was shared with friends. I start blogging about my trip that took place some 10 years ago. After visiting Moléson, a mountain of the Swiss Prealps and the medieval town of Gruyères, next stop was Lucerne and the boat trip on the Lucerne lake. 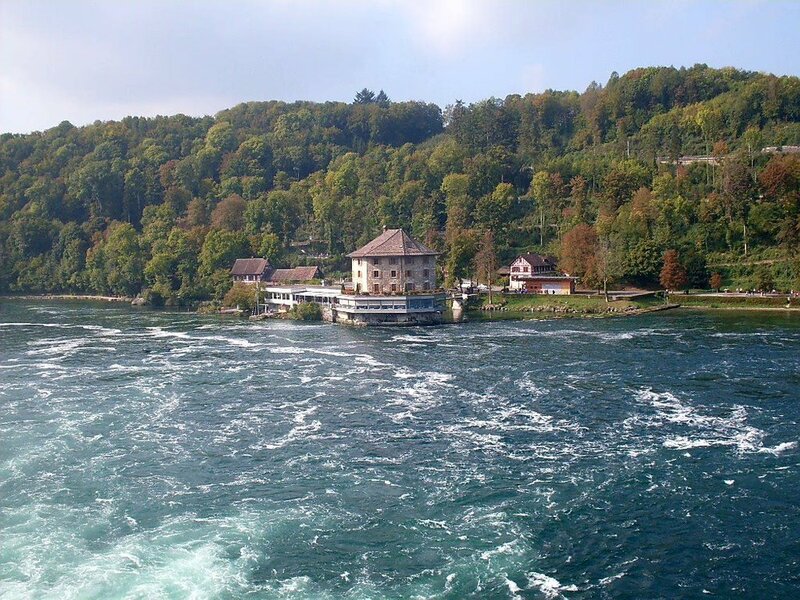 Today I will continue the trip by showing the Rhine Falls, the biggest and most famous in the country. 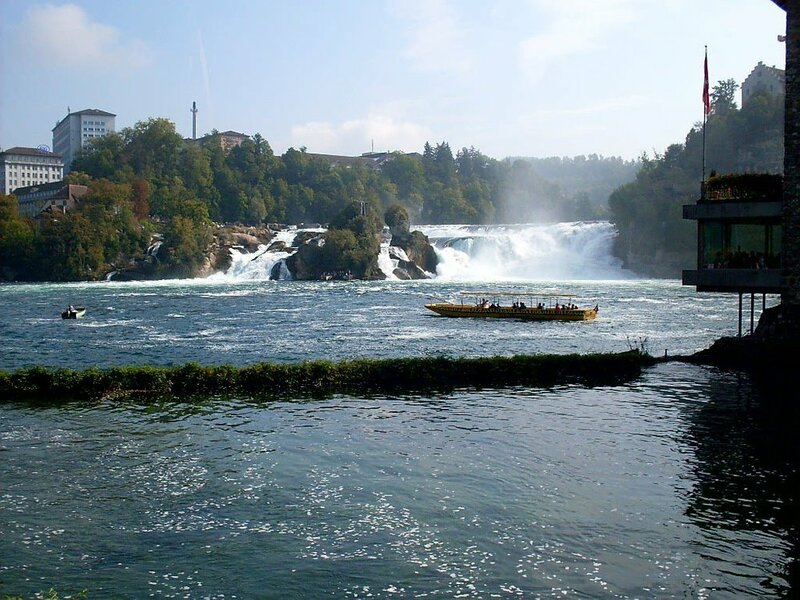 Also the falls are claimed to be the largest in Europe with its 150 meters width and 23 meters height. 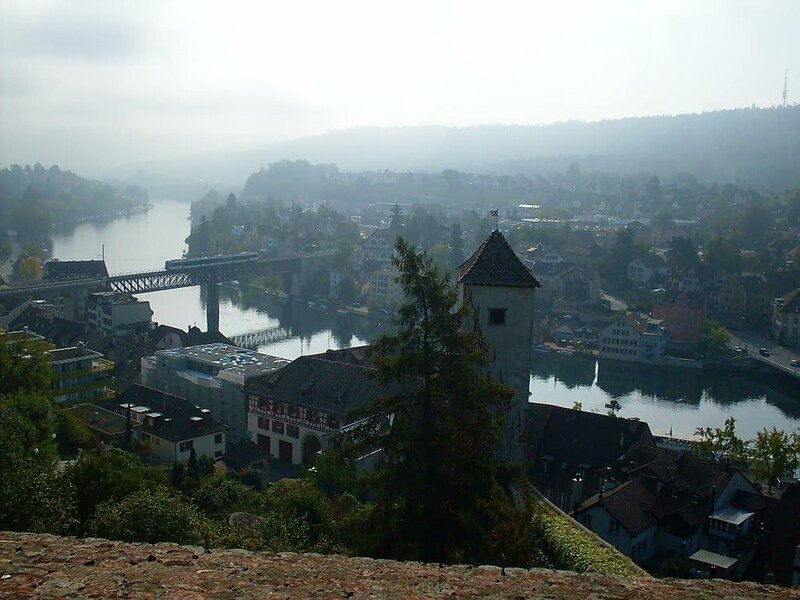 We arrived in the town of Schaffhausen, situated in Northern Switzerland, where river Rhine flows through it. Like the rest of the week, we enjoyed very nice weather. Although it was misty morning and the mist has covered most of the town like shroud. The town is capital of the canton with the same name. 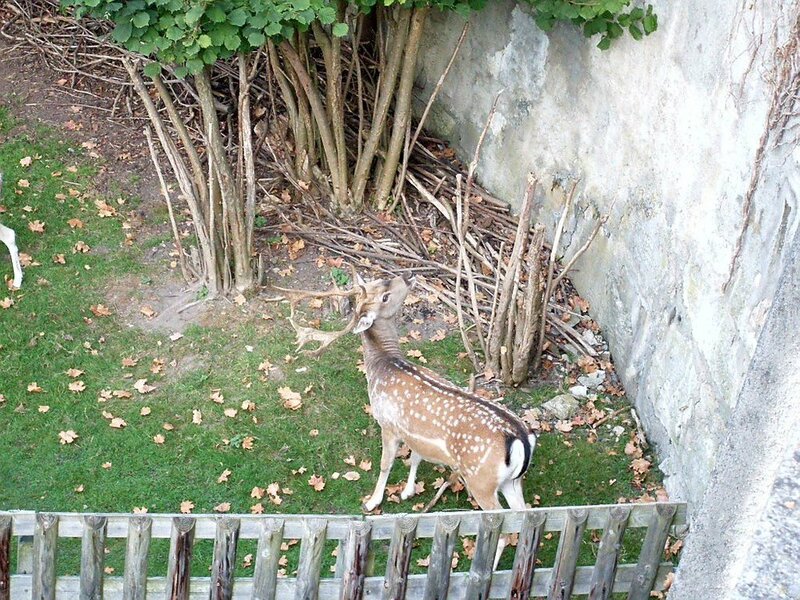 Before we went to see the falls we stopped at the Munot, a circular fortification from 16th century. The ring fortress hosts different events nowdays. 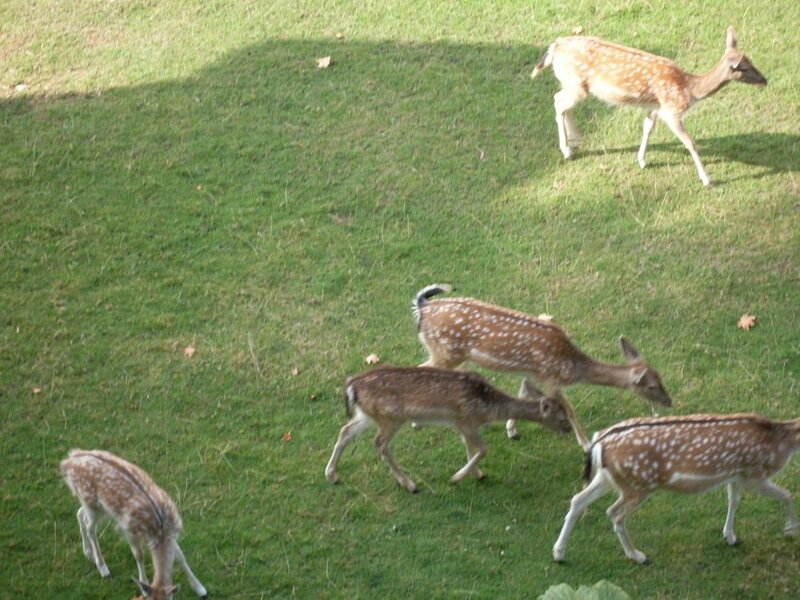 But the most amazing was the inner yard with deers and does roaming free. 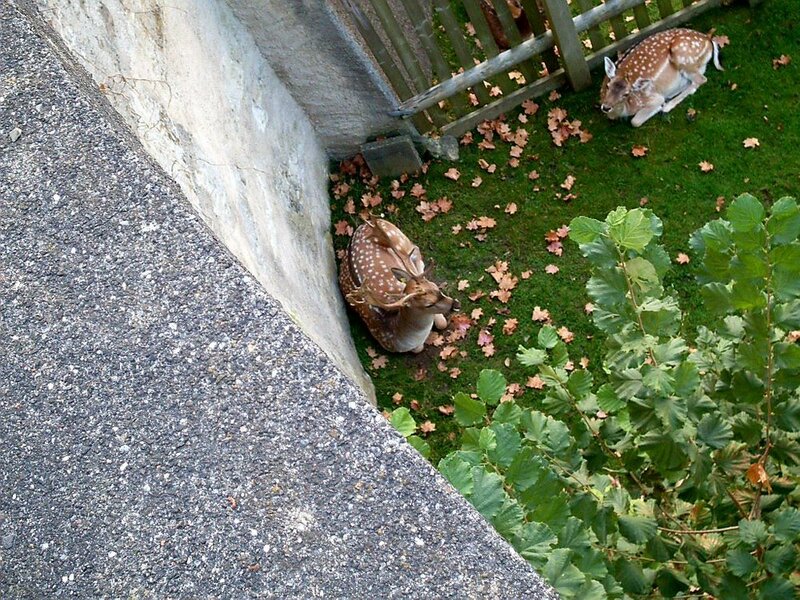 They were sheltered behind the high wall. 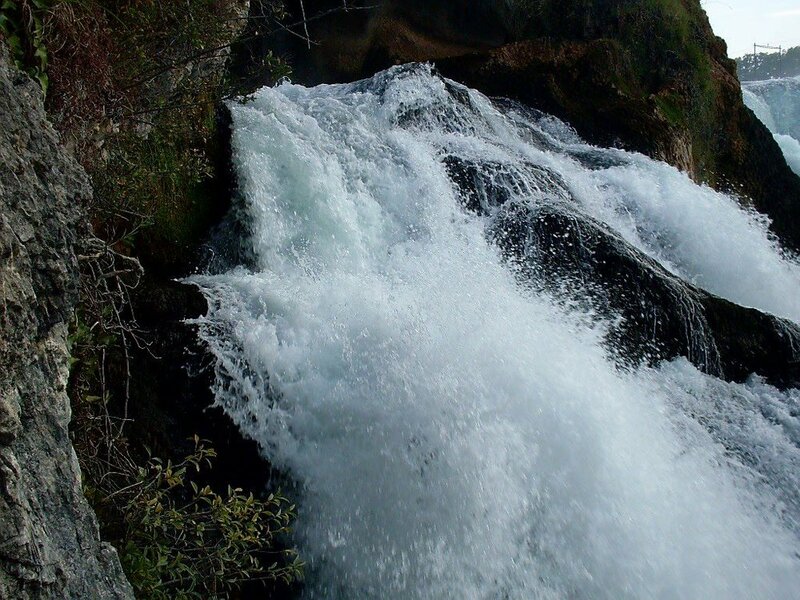 It was time to move forward and to head towards the falls. 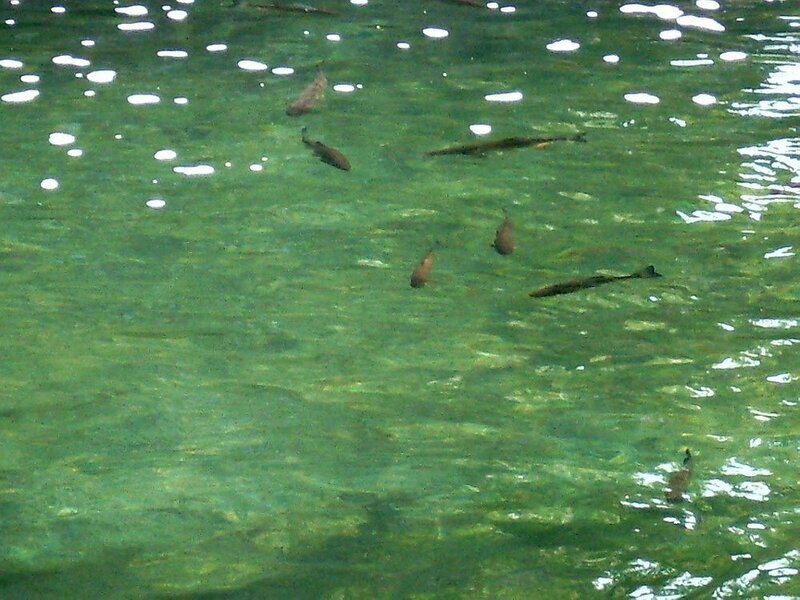 The cristal clear water of the river allowed us to see the fish next to its banks. I am not sure, but I think it was trout. 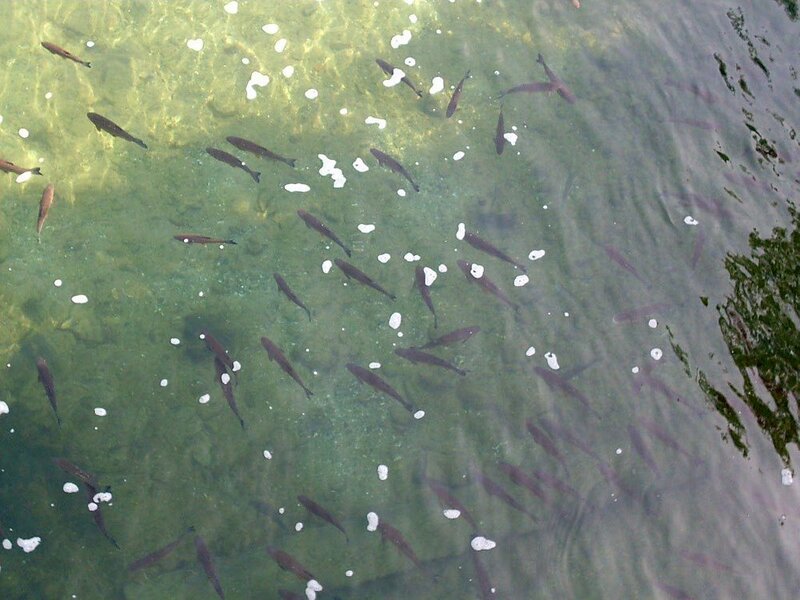 I have never seen so much fish, so close. Fisherman boat was close to the falls and the fisherman was not disturbed by the bunch of tourists standing on a platform in the middle of the falls, where the mighty rock was standing. From the platform the stairs lead to the top of the rock. That photo was made without zooming and if I crop it, the quality of the picture shall be ruined. But I hope you can spot the people on the platform as well as the ones on the top of the stairs. Did you see the Swiss flag on the top? Next it was our turn to get into the tourist boat to see that platform. Now we are on the board of that yellow boat and the view from there was stunning. We could hear the roaring sound from the falling water the closer we were getting. 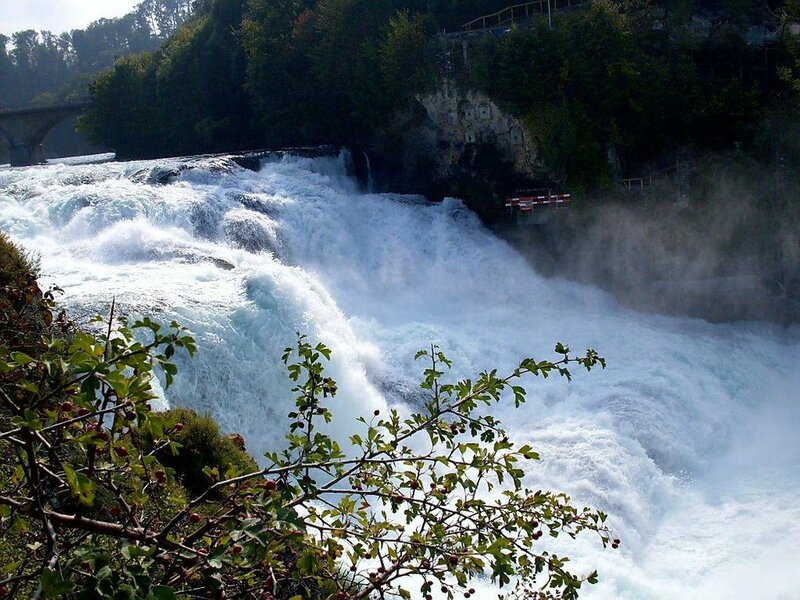 Some facts about the falls. 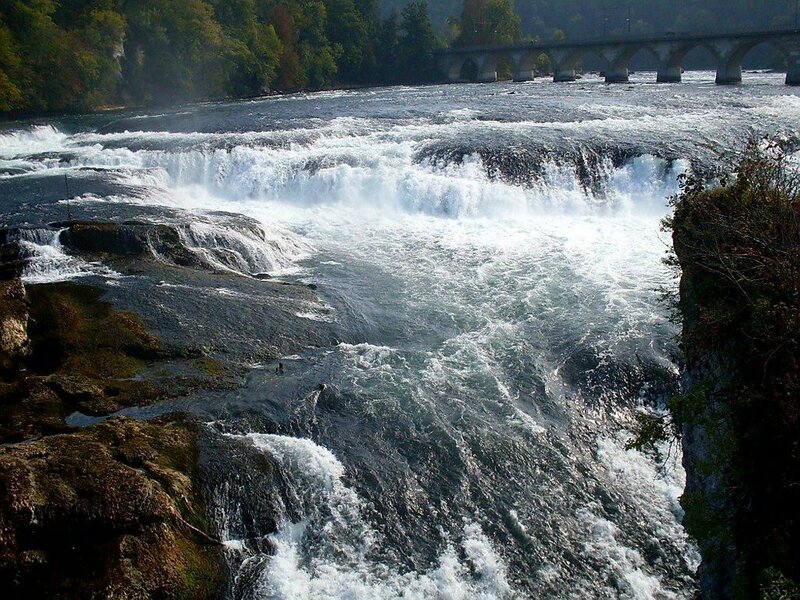 The falls basin is 13 m deep, average water discharge per second in summer is about 700 cubic meter. 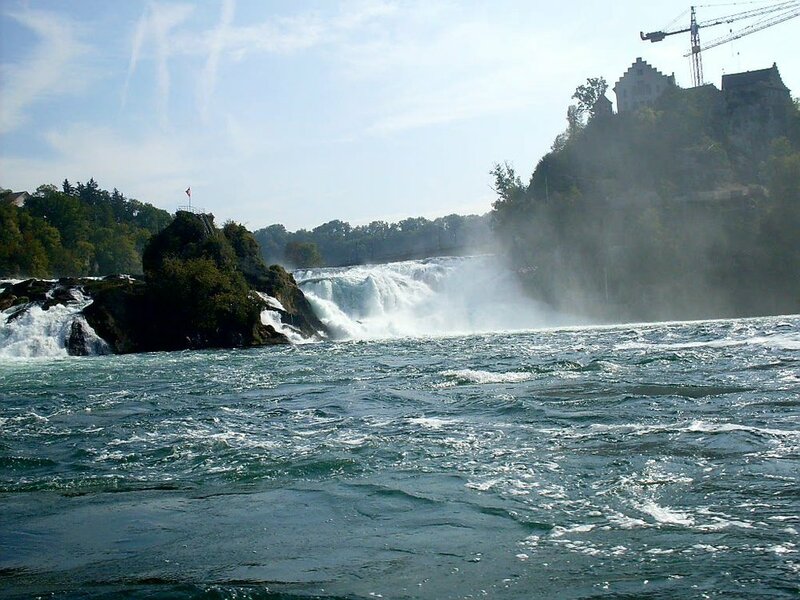 In comparison Niagara falls discharge is 2 400 cubic meters. 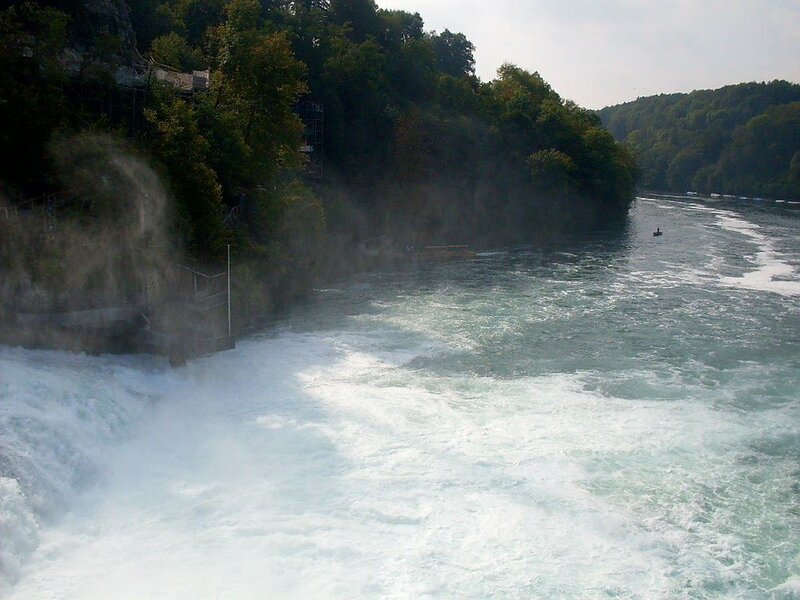 The Rhine Fall is approximately 16 000 years old. We reached the rock from where we could see the starting point and the green hills behind. It was October and the autumn has already started painting the leaves of the trees. What you see on the bank is an old building traced back to the 12th century. 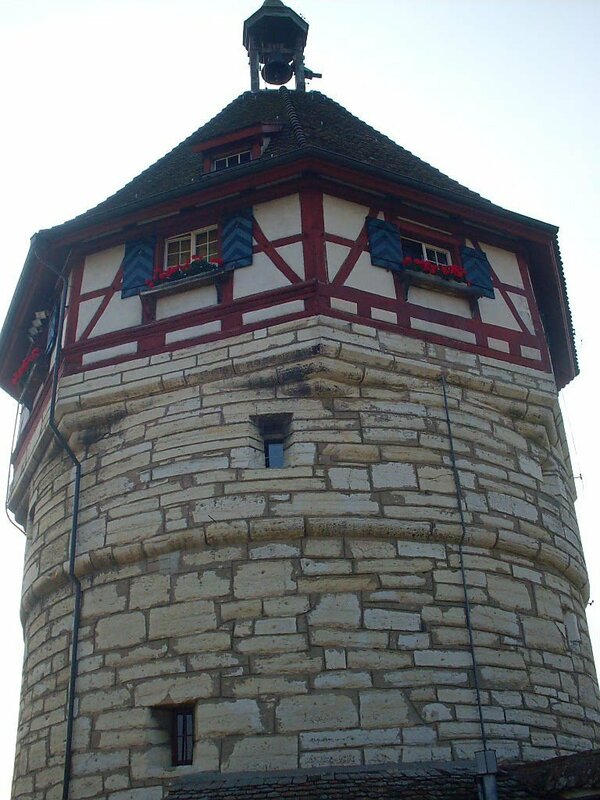 This is the Wörth Castle, that once was customs house and tax collecting point. The building has seen recoveries in the course of time. 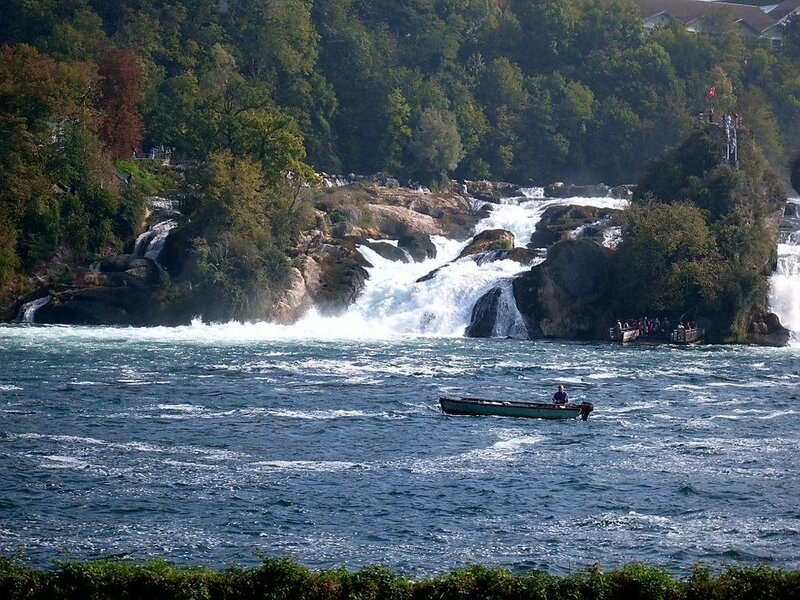 Now there is a restaurant with nice terrace overlooking the river and the falls. 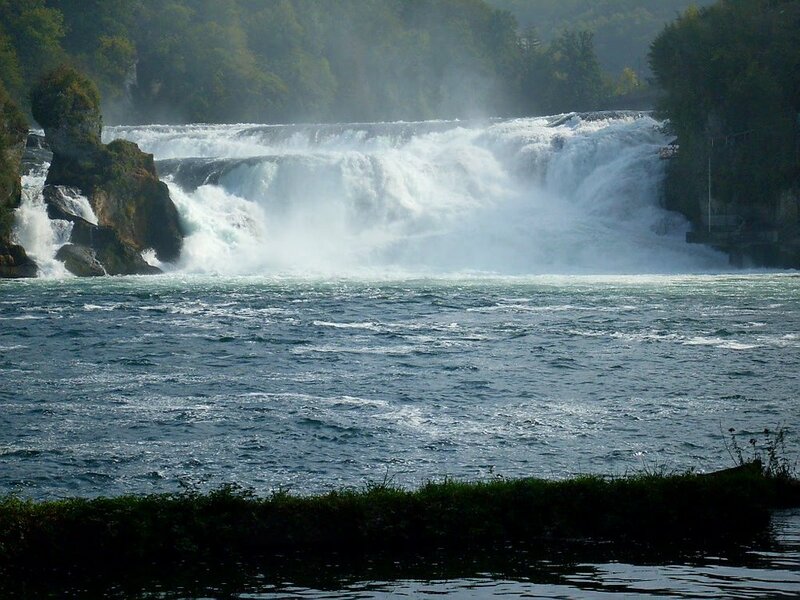 The close view of the falls was fantastic and you could feel the sprinkles creating mist above the water. The boat made return tour and we were back on the bank where we had the pleasure to hear the Swiss alphorn or alpine horn. That instrument was once used by the shepherds to call the cows from the pastures, when it was time for milking. Now it is another symbol of Switzerland. 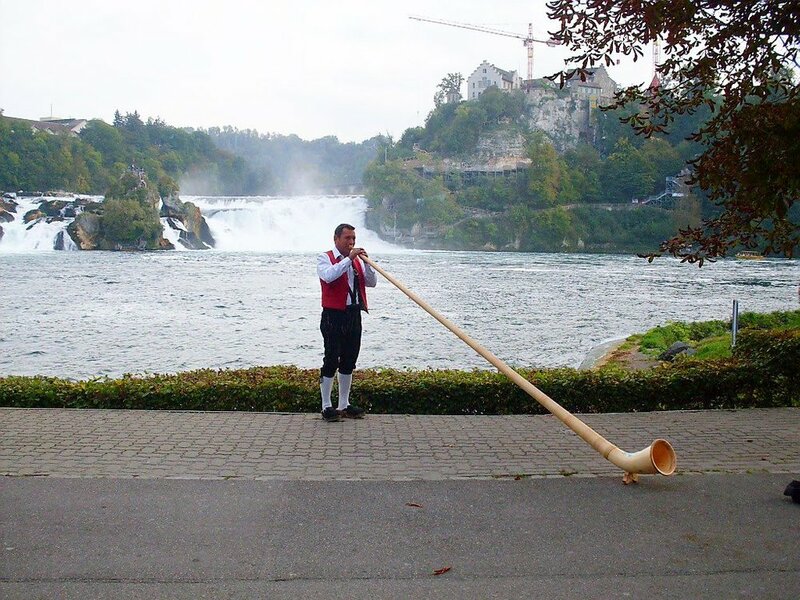 The wooden horn is over three meters long and looked like huge smoking pipe. 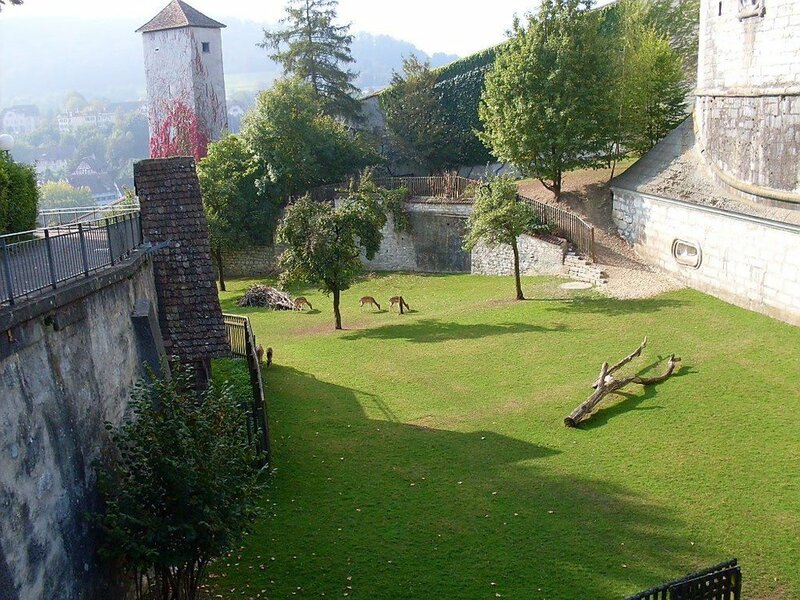 Behind on the right side on the top hill is Laufen Castle. That was all for that day, another exciting trip leaving me nice memories. This is my first post using steempress with the kind support of @mmunited, who offered his WordPress site, so I can complete the task. The task was to create a post via steempress and this is a part of the project #tenkminnows. Thank you @steemcommunity for giving us this opportunity. I could not miss to mention my dear friend @melinda010100 who first nominated me for the project. 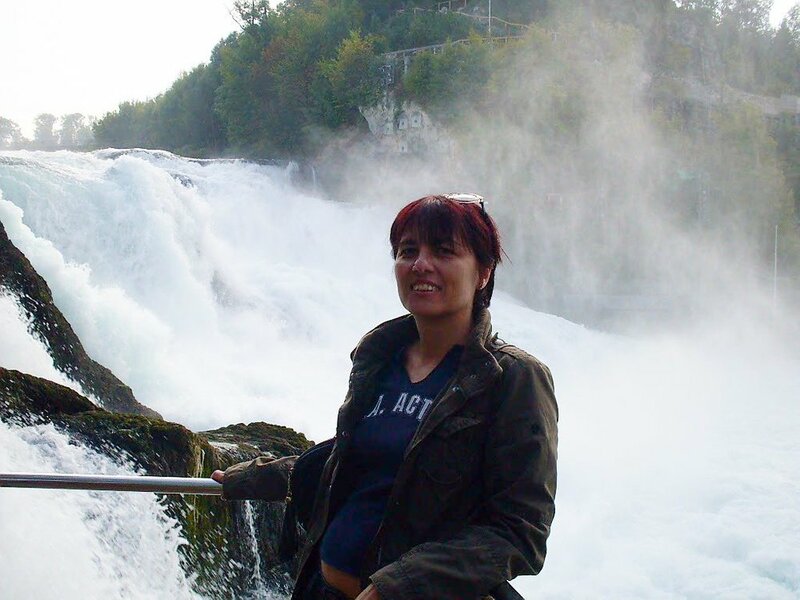 I wonder if she has visited the falls, since she has been in so many places. If you have been patient to reach this end, I am most thankful for your time reading my blog.